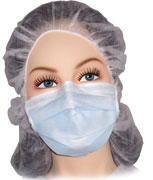 This general purpose mask is easy to slip on and off with single elastic band around the back of the head. 99% plus filtration efficiency. No fiberglass. Built in contour bar fits snugly over the nose. This single band mask is Blue and Latex Free.